MSF medical teams began carrying out specialized surgical procedures today in inflatable structures put up by MSF late last week in Gaza City. The two hospital tents include operating theaters and a 12-bed, post-surgery recovery and post-operative care unit. MSF medical staff treats an injured child at MSF post-operative clinic in Gaza City. Doctors Without Borders/Médecins Sans Frontières (MSF) medical teams began carrying out specialized surgical procedures today in inflatable medical structures erected by MSF late last week in Gaza City. The two hospital tents include operating theaters and a 12-bed, post-surgery recovery and post-operative care unit. Three people were operated on today, including a two-year-old girl suffering from severe burns, a four-year-old girl requiring skin grafts, and a 22-year-old man with a severe hand injury. All were wounded in bomb blasts. Five more surgeries are scheduled for tomorrow, with more to follow in the coming days. Extensive assessments carried out by MSF over the last few days throughout the Gaza Strip have revealed significant needs for secondary and specialized surgeries for people injured in the intense fighting between Israeli army forces and Hamas during the first three weeks of January. 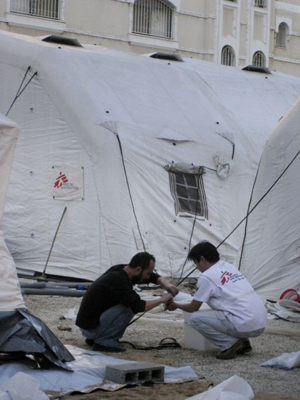 MSF staff sets up an inflatable hospital in Gaza City. Throughout the fighting, many of the injured found themselves in overcrowded and chaotic hospital emergency rooms. Medical staff were forced to triage the most severe cases, resulting in many people being treated quickly and then discharged in order to free up space for other wounded. As a result, injuries were not sufficiently treated and many people now require follow-up surgical procedures. "We are talking about war-related surgery—dirty surgery," said Marie-Noelle Rodrigue, MSF emergency coordinator in Gaza. "There are lots of orthopedic cases, people requiring skin grafts because of severe burns, and many people requiring wound debridement (removal of infected or dead tissue). It's difficult at this point to anticipate exactly how many people require specialized surgical care, but the numbers will likely increase as we continue assessing and as people learn about the services now available to them." The current MSF surgical team consists of 25 staff, including three surgeons, two anesthetists, one OT nurse, six nurses, and 13 support staff. The entire MSF team in Gaza currently consists of 80 Palestinian staff and 13 international staff. 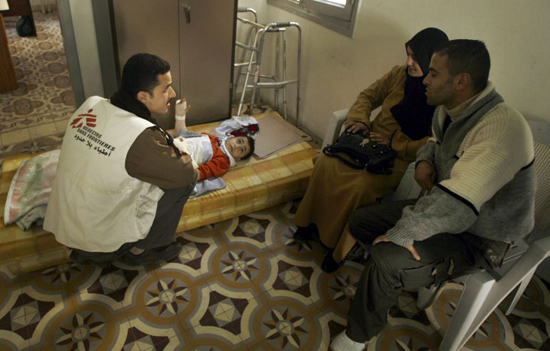 A referral system has been arranged with Al Shifa Hospital in Gaza City and other health centers in the Gaza Strip. Backlogs of patients requiring specialized and secondary surgeries will be referred to the MSF facility. The MSF clinic in Gaza City will provide post-operative care and treatment. The clinic was already providing out-patient care before the fighting, but is now receiving more and more patients, including 17 new cases over the last week. Another MSF post-operative clinic in Khan Younis, in the south of Gaza, received 31 new patients over the last week. Plans are underway to open an additional clinic in the north of Gaza, where fighting was particularly heavy, and to reinforce staff at all MSF clinics given increasing caseloads. MSF already operates a pediatric clinic in the northern town of Beit Lahia. All the clinics will refer eligible surgical cases to the MSF hospital facility in Gaza City. Existing MSF mental health services will be expanded with the inclusion of two additional psychologists in the team. Particular needs have been identified among frontline health workers, including ambulance drivers, paramedics, and emergency medical personnel. "They are often the forgotten ones during conflicts," said Rodrigue. "But they are very much affected, given what they witness." Health care workers were particularly affected in the north of Gaza, in the areas of Beit Hanoun, Beit Lahia, and the Jabaliya Refugee Camp, which bore the brunt of the Israeli ground incursion.